Create a focal point in your flower garden, near a pond, or along a wall. Or, place it in a quiet spot where you can get away from it all. 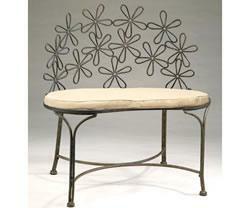 Made from solid steel, this charming bench includes a baked on powder coated finish for lasting durability. The natural patina appearance nicely complements any decor or color scheme.